Honestly, this duck dish does not have a name. But it is the duck dish for all duck dishes because this is a basic duck preparation that anyone can use and then customized to their liking. I love duck. It’s one of those meats that I can’t get enough of. Have you had Chinese roast duck? That crispy brown skin and gray flesh nicely imbued with Chinese spices and herbs? It is to die for. But I do not have time to dry and blow a whole duck’s skin up before roasting for that Peking goodness so I make do with a nice slab of roasted duck breast from Lac Brome Ducks. Why are ducks from Lac Brome Ducks special? I just know that this is the oldest duck-breeding farm in Canada that breeds Peking ducks – and knowing that their ducks are not forced-fed for foie gras is good enough for me. It’s really easy to get duck at the market, your every day grocery stores carries frozen duck breasts in their freezer sections at the very least. And cooking duck breast cannot be any easier. Duck is probably the only poultry you can eat a little raw. You treat it like steak and cook it to your desired done-ness; I like mine medium. There are two ways to finish cooking this roasted duck breast, on the stove top or in the oven. This is the stove top method. 1. Crush the Szechuan peppers with cumin until powdery fine. Use a pepper mill to do this. Mix it with the garlic powder to combine well and set the seasoning aside. 2. Make small slits on the duck skin, in a crisscrossed manner – be careful to not cut through to the meat. 3. Season with salt and pepper throughout the duck breast. Rub the seasoning spice you had milled on the meat of the duck and not the skin. Let the duck breast sit for about 15 minutes so the flavors of the spice get a chance to work its magic through. It would be best if you could let it sit in the fridge overnight. 4. Heat a skillet on the stove – there is no need for any oil. 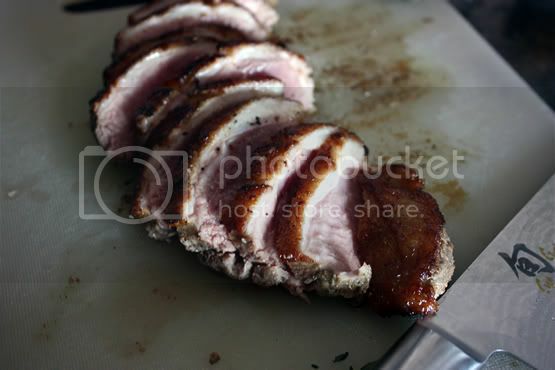 Once the skillet is really hot, put the duck breast in skin side down and let it roast in the pan for 5 minutes. Reduce heat to medium. At this point you’ll be seeing a lot of oil gathering around the pan, save two teaspoons for the sauce later. Or save it all and use it as you would with olive oil, just remember to store it in the fridge so it won’t go rancid. 5. After 5 minutes, pour the excess oil out into a small bowl. Turn the duck breast over and cook for another 4 minutes. 6. Remove nicely pan roasted duck breast onto a cutting board to let it rest for 10 minutes – cover with some aluminum foil. 7. In the same skillet, add two teaspoon of the duck fat and the crushed garlic. Saute until the oil is fragrant and then add in the chicken broth, star anise, brown sugar, five spiced powder and thyme. Scrape the fond off the skillet and let concoction boil until it is reduced by half. 8. 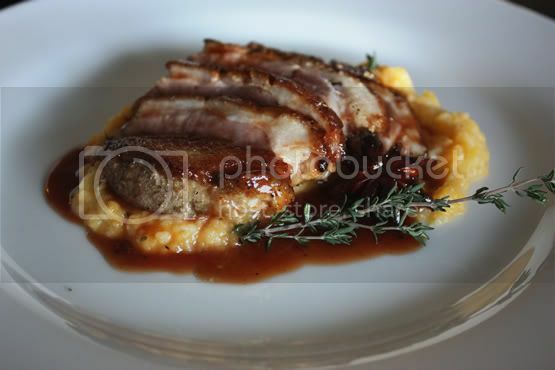 To serve, slice the duck breast as thin as you want, serve with some sauce. I served mine over some left over butternut squash puree. MMm! You can make changes to this duck recipe to suit your taste. Duck a l’orange? Sure, follow the recipe for the sauce and drizzle it over the roasted duck breast. Duck is a very tasty meat on its own and while you pay premium price in restaurants, you can easily make it at home at a fraction of the price! I don't do duck often, but this looks so easy I'm tempted. Mary: A lot of times, people think duck is difficult to cook but it's not true. It's quite simple, and you treat it just as you would with say a nice piece of steak. 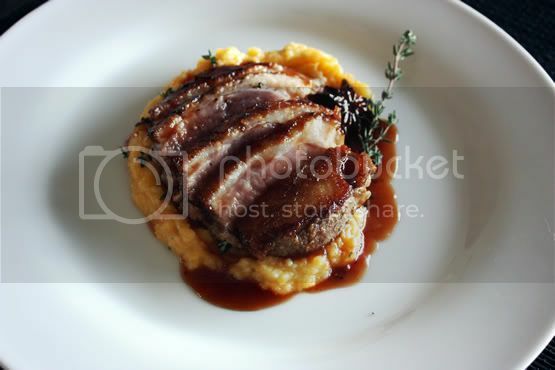 The roasted duck breast looks delicious. Can imagine if you prepare a whole duck roasted to perfection. Looking forward for it. Yum! I love duck too, but I always seem to turn to the same recipe (pan-seared, and served with a vinegar-honey reduction and sautéed apples). This sounds like something I should really give a try! Your duck looks absolutely sublime. I am definitely going to give this a try soon. I rarely cook duck but I will soon after seeing this! Sasi: it went into my tummy, yummy! I love the Loc Brome duck breast and I was able to find it in Boston, but I'm now in Ohio, is there any place to buy these online? Nice recipes, but DO THEY REALLY HAVE TO COME WITH AN ADVERTISEMENT FOR LAC BROME? (Or for anything else, for that matter?) If Lac Brome is providing you with some promotional consideration, why not just go ahead and say so?